Hey guys! I am so excited! It finally worked out for me to go see Disney's 50th animated film, "Tangled". I thought I'd share a few thoughts about the movie with you. Let me just start by saying that this movie met my high expectations. The characters were engaging and funny, the story was entertaining, and the animation was absolutely beautiful. I didn't see it in 3D because I just wanted to focus on the story itself the first time I saw it, so I can't tell you how it was in 3D. Even in regular 2D, though, the movie is so lovely to look at. I've had my concerns about how this movie would end up. From the previews it looked like they were just trying to make another "Shrek" type movie. It looked like a hip, modern comedy. That's really not the feel of the movie, though. Sure, it has its humorous parts, but it's also got a lot of heart, beautiful music, and romance. Most importantly, it didn't delve into the crude sexual and toilet humor that the Shrek movies did. That's something that I've always appreciated about the Pixar movies. They didn't use crude humor to carry their movies. Pixar every once in a while had some small things interspersed, but it was nothing like the content in the Dreamworks movies. I'm glad to see that Disney is going the same route (having John Lasseter at the helm is a big part of that, I'm sure). In all fairness to Dreamworks, though, their movies have cleaned up considerably (I especially enjoyed "How to Train Your Dragon" and "Kung Fu Panda", where the crude humor was toned down considerably-in HtTYD it was almost non-existent). Another thing I really appreciated about this movie was that it really didn't have a lot of "scary parts". The scenes with Mother Gothel were very emotionally intense and manipulative, but overall, this is a movie that could be watched almost all the way through even by my 2 year old (minus a few emotionally hard parts and 2 intense scenes). You know, everyone keeps talking about how "The Princess and the Frog" didn't do as well as expected at the box office, which was part of the reason that Disney completely revamped "Tangled". Several of the articles I've read said that Disney felt that the reason "The Princess and the Frog" did so badly is that it didn't appeal enough to boys. They also mentioned the shifting target audience, as little girls are growing up faster and faster. It's now 4 year olds and under that are the most interested in princesses. That being the case, could one of the reasons that "The Princess and the Frog" failed to meet expectations be the demonic bad guy scenes? I mean, if I had seen TPATF when I was a young girl, those scenes with the creepy shadows chasing Tiana and Naveen through the city and bayou would have given me nightmares for weeks. And what about that big ram's head mask that Dr. Facilier was always negotiating with? Not to mention the ending, where the doctor gets dragged to his own grave. For a target audience between 2 and 4 years of age, that seems a bit inappropriate, don't you think? My own 2 year old daughter LOVES Princess Tiana, but there's no way I'd allow her to watch the movie...I want to sleep for the next 3 months, not be up comforting her from bad dreams. :} Quite honestly, not even my 6 year old could handle that movie. How refreshing, then, to have a Disney princess movie that my girls can watch most of the way through! If Disney made more movies like this, maybe they'd do better at the box office! I really appreciated the sacrificial love displayed by both Rapunzel and Flynn towards the end of the movie. Love is seeking the best for the other person, by the Biblical definition. Both characters displayed this. I love it when movie characters make decisions that make them good role models for the young people watching them. Although Flynn starts out as a selfish rogue, in time he begins to see Rapunzel's good qualities and appreciate her for the person she is. He wants to do what's best for her, no matter what the cost to himself may be. Rapunzel also grows from an unsure, frightened girl to a confident, brave young woman, willing to risk everything to save the one she loves. Finally, I have to talk about the music. As I mentioned in an earlier post, the music was composed by Alan Menken, who brought us musical treasures from "The Little Mermaid", "Beauty and the Beast", "Aladdin", "Newsies", and "Enchanted", among others. Because I grew up listening to his music, it was especially fun for me to hear it again in this movie. Many reviews have called his score for "Tangled" nice but forgettable. It may not be his most amazing score ever, but I really enjoyed it. The music fit the movie perfectly. And, just as I thought I would, I loved seeing "I See the Light" in the context of the movie. It was beautifully sung and beautifully animated. On a scale of 1 to 10, I would give this movie 10 stars, and I'd highly recommend it. For those of you who've seen it, what do you think? Did you enjoy the movie? What would you rate it? P.S. For those of you who are interested, I've included a link to the pluggedin.com movie review of "Tangled" HERE. Pluggedin.com is a Christian website affiliated with Focus on the Family that reviews movies, music, TV and more from a Biblical perspective. It's also a great way to evaluate a movie before seeing it in the theater, as it tells you all of the possible objectionable content. It's a wonderful resource for families. Just a few warnings: 1. These reviews sometimes have spoilers, although they announce them as such in the article. If you like to be completely surprised, I wouldn't recommend reading their articles. 2. They have several categories that list everything that happens in the movie, such as Violence, Sexual Content, etc. In each category, they list everything that a parent might want to know about the movie. So in the Sexual Content part, they will mention if any characters kiss or have revealing clothing. I just wanted you to know they're not saying kissing is evil, per se. :) They just want parents to be able to evaluate what is in the movie and decide for their own families what is most appropriate. Happy Thanksgiving to everyone! I hope you all have a great time celebrating with family and friends. Enjoy your turkey, football, parades, and whatever other traditions you share each year. I hope that in the hustle and bustle we all remember the true reason for this holiday: being thankful to God for His many blessings, and also remembering the first Thanksgiving feast shared by the Pilgrims and Native Americans. Our family has a great book that we read every year for Thanksgiving. I've always been saddened by the fact that Thanksgiving is so overlooked. It seems like our country goes straight from Halloween to Christmas. It is so important for us to remember the founding of our country, and the brave men and women who came here so that they could have religious freedom. Of course, part of the problem is that Thanksgiving isn't nearly as marketable. There are some Thanksgiving decorations, but not nearly as many as for Christmas. And how many of us have a cd of Thanksgiving music? I tried to think of a way to fix this problem for several years. Then, last year I was listening to our local Christian radio station and heard an interview with a lady who had the same concerns. Her name was Barbara Rainey, and she had written a book about Thanksgiving that could be used by families to help remember the true meaning of the holiday. I found a copy online for a good price, and we started using it that very year. The book is called: "Thanksgiving-A Time to Remember". After a short introduction explaining the author's reason for writing it, the book starts with the story of the Pilgrim's journey across the Atlantic on the Mayflower in 1620, to the very first Thanksgiving feast in 1621, and goes all the way to the Thanksgiving feast of 1623. The story has sections printed in large and small type, so that those with younger children can read only the large type parts and still get the essence of the story without losing the attention of their little ones. There are also extra articles interspersed throughout the book with more in-depth information on certain subjects. I wish you all a wonderful day with your loved ones. Now all I have to look forward to today is acting as referee for 3 cranky kids (my oldest has the day off from school and everybody's been arguing all morning). Whoop-de-doo! I just hope they all nap today...because I need one too!! Okay, finally, as promised, here is part one of Emily's re-stringing. It is only part one because this ended up being a much more involved project than I thought, and as of right now, Emily still only has one leg and no stuffing! :} After starting this, I've definitely decided that I will only do this to dolls that absolutely need it, because it is a PAIN!!! The other thing I wanted to mention is that it was next to impossible to find the brass inserts for the doll legs!! I went to both Home Depot and Lowes, armed with the name of the brass inserts Sarah held up in the video, determined to be confident. You have to understand, I have a complete inferiority complex when it comes to hardware stores, so I always want to know exactly what I'm looking for ahead of time. Otherwise I feel like the helpless little housewife who's completely clueless!! Imagine my embarrassment when, after wandering around for a while with no success, I worked up enough courage to ask a sales associate, and he had no idea what I was talking about! This happened at both Home Depot and Lowes. By this time I was pretty discouraged and decided I'd go home and watch the video again to make sure there wasn't something I was missing. Thankfully, my wonderful hubby watched Sarah's video with me and headed to Ace Hardware. He returned with the inserts. What a guy! Apparently, I'd been looking in the wrong section. So, if you go to look for these, be sure to check in the plumbing section, not in the aisle with the screws, nuts and bolts. I also wanted to say that for this first part, we used the crimpers instead of pliers. I'm thinking I'll probably try pliers for the other leg so I have a good comparison. The crimpers bent the brass easily, but sometimes they bent it TOO much. My hubby actually broke through one insert completely. Wow, that was a long-winded intro! Sorry about that. Wordiness is one of my worst flaws! :} On to the pics! The first step is to untie your doll's neck strings. It was a little tricky getting Emily's knot undone because it was so tight, but eventually it came loose. ...and here's a pic of her body sans stuffing! Once the doll's stuffing is removed, find the limbs inside and cut the elastic attached to the loose limb. There will be a white plastic cup attached to the elastic. Set this aside for later. Look inside the doll's leg. You'll see a white plastic cup and the other end of the cut elastic. You can remove the elastic piece by shaking it out. To remove the plastic cup, use your pliers or crimpers to grab hold of one of the cup's edges (this is where my hubby took over). Gently pull the cup out of the leg at an angle. If the cup is too big to fit through the opening as is, you'll have to use your hair dryer to soften the vinyl of the leg. This will allow the cup to pop out. (If you want to see a demo of this, click the above link and watch Sarah's video) As it turned out, we didn't need to use a dryer on Emily; the cup came out nicely without it. Now, take one of your Goody elastic bands and cut it in one place. The brass is tight enough when it keeps the elastic from sliding out, even when you pull on it. Poke the elastic through the hole in the plastic cup (the one that was inside the doll's leg). The wider end of the brass insert should be against the bottom of the cup, as shown in the picture. You can trim the excess elastic from the small end of the brass insert. Once the elastic and cup are in the leg, you need to thread the elastic through the leg socket in the bottom of the doll's cloth body. Get the leg as tight as you can in the socket, then put the elastic through the other white cup (set aside from before), with the open side of the cup facing down. Take the other brass insert and thread the elastic through it. The bigger end of the brass should be against the white cup, as demonstrated in the pic. Get the brass insert as close to the plastic cup as you can, and then use crimpers or pliers to squeeze the brass around the elastic. When the elastic doesn't slide through the brass insert, it's tight enough. Cut off the excess elastic. And now, you should have a tight, attached limb! Poor Emily, waiting for her other leg!! I apologize for the quality of the pics...the lighting wasn't the best when I took them. Just thought I'd do a quick post because I found this video on Youtube (click here) that has one of the songs from Disney's new movie, "Tangled", which is coming to theaters in just one week (yay!). I have to admit, I have high hopes for this movie. I was a little concerned for a while with all the changes they were making to make the movie appeal to boys as well as girls. As soon as I saw the first real trailer, though, I started getting excited. The animation looks AMAZING (which is a big must for me), and now hearing this song is very encouraging. Okay, moving on! :) The song is performed by Mandy Moore and Zachary Levi (from the TV series "Chuck", which I don't watch, but I've seen previews for), who also play the speaking voices for Rapunzel and Flynn Ryder. Mandy Moore's never been my favorite singer, but I thought she did an excellent job on this song. And wow, Zachary Levi's got a nice singing voice, too! Not your typical sound for a Disney "prince", but I think his vocal style fits the character, and it's a pleasant voice to listen to. I could see this song becoming the next big Alan Menken hit, like "Beauty and the Beast" and "A Whole New World". I'd be interested in hearing what you guys think (those of you who care about Disney movies, that is). :) Do you think this will be a successful Disney film, or a flop? Are you excited about it, or could you care less? Do you think you'll go see it when it comes out? Have a great week, and keep checking back. I'll be doing my posts about Emily's restringing soon. Hey guys, just had to do another quick post to give you some news about Katie's travels. I talked to my friend that she's been staying with, and it sounds like Katie won't be coming home right away. There are a few more places she wants to visit. :) My friend emailed me 2 pics to post on the blog, though. Can you guess where Katie went? 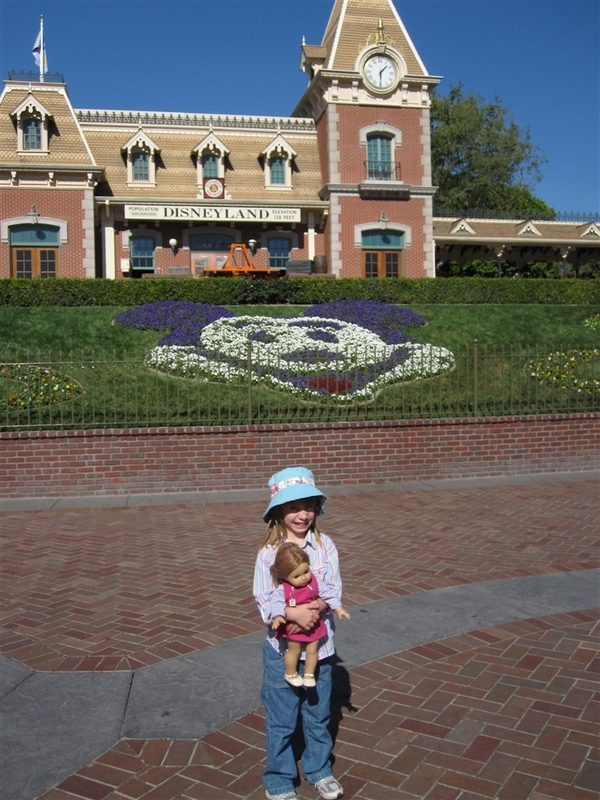 That's right...DISNEYLAND RESORT!! I'm so jealous. :) My daughters loved seeing these pics. 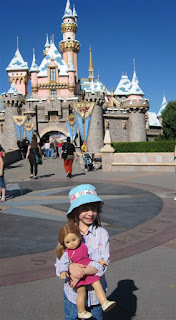 They thought it was so neat that Katie got to go to Disneyland with their friend. I'll be sure to keep you posted on Katie's further adventures. 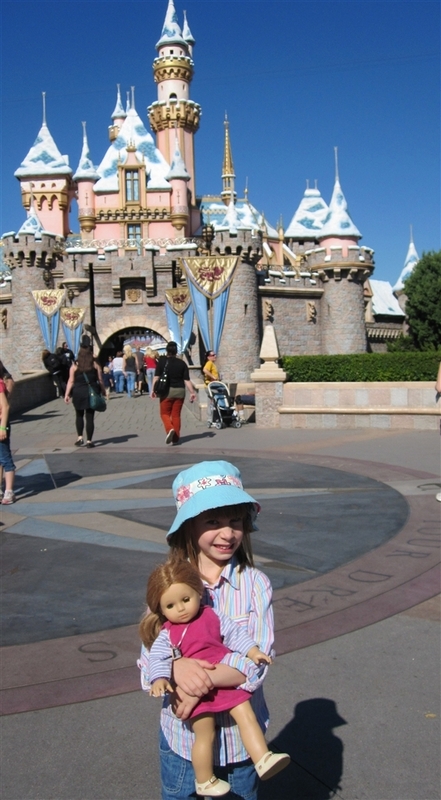 My middle daughter's "set up" with her doll, Leisel. My oldest daughter found this little peeper frog in the front yard and had lots of fun playing with it. As for the frog, it was most likely the 20 most terrifying minutes of its life, especially when my 2 and a half year old wanted a turn holding it. :) My middle daughter took after her mother and refused to touch the frog because it was slimy. My youngest obviously had no problem with frog slime. She kissed it (I think she's seen the previews for "The Princess and the Frog" a few too many times!). :} Yuck! !